If your garage is cluttered with tools and stuff your significant other can’t get rid of, this 10x12 tool shed will answer your prayers. Featuring over 823 cubic feet of storage space, there will be plenty of floor space for lawn mowers, tractors, ATV's and bicycles. Once you add a shelf and or workbench, you will have even more work space to complete your day to day projects. This premium tool shed was hand-crafted in the U.S.A. to outlast the typical plastic and metal sheds you might find at big box stores. The specially manufactured wood siding is factory primed and is completely resistant to rot, decay and insects. With the classical roof style and ample storage space, this 10x12 shed is the perfect outdoor storage solution for just about any yard. Your local building authority may have specific requirements resulting in additional cost. Prices do not include painting, staining, permits, zoning and setback advice and/or compliance, excavation, or leveling beyond 6". All prices and content are subject to change without notice. Promotions are valid with online transactions only and cannot be used in conjunction with promotions at a servicing sales/distribution center or distribution center. Not valid on prior purchases. All stated sizes are nominal dimensions and approximate. Some buildings may be shown with optional items. Additional mileage charges (if applicable) and taxes will be calculated after checkout process is completed. 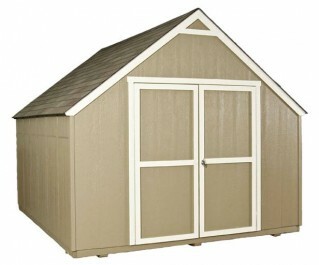 Painted 10 x 12 shed is a representation only, arrives primed for painting in a light beige color. Couldn't beat the price. Delivery and installation was great. Would highly recommend. Best Shed for the money. 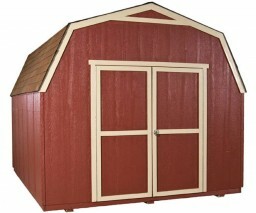 I purchased this shed 3 years ago and I am impressed with the quality and workmanship of this item. I loved the fact that the shed was installed on site. I watched the whole process and was amazed at the efficiency and how quickly it was up, the person that did the installation was very courteous. They were very professional when i called to ask questions and the ordering process was a breeze. They did and excellent job. I am looking forward to ordering another shed soon. I was a very satisfied customer. Lucy Abrego from Santa Ana, Ca. I made the right choice with Shed Liquidators. Super easy choices and built in one afternoon. I watched as my shed went up. Quality wood and shingles. I had it painted within a couple of days and the only things I regret are not getting the ventilation package do to the hot Texas summers and that the door lock has jammed and will not take the key. I am extremely pleased and recommend Shed Liquidators to my friends and family. We purchased the shed to protect our well, tanks, and treatment equipment after a fire. When the permanent structure was being built, we had to move the shed. We moved it with a fork lift and are now using it as a chicken coop. It moved beautifully and with an addition is now a super all weather home for our chickens. Extremely sturdy and has held up well during the Pacific Northwest winters, rain and significant snow. I've had the shed for 3 years or more. No problems, has held up well. Use it for mowers & tools, works great. They showed up on time, assembled the shed, cleaned up and left. I ordered a shed, paid for it and While waiting for it to arrive. I was given a larger storage unit. I hated to call and cancel but could not have asked for any better customer service! Very pleasant and accommodating .... issued me a full refund . I would definitely recommend. After that I suggested them for their structures and affordable prices. Mysister bought a building and loved it! These sheds can't be beat for the money and labor involved. I'm a remodeler and I can't do it for this price..
3' of clearance around your entire building is required. 4' if larger than 160 sq. ft.